The Faithful Four continues today as Dietrich Bonhoeffer takes on Emma of Hawaii for the right to face Mary Magdalene (who dominated Margaret of Scotland yesterday) for the 2012 Golden Halo. This match-up features one of the favorites to make it to the Faithful Four (Bonhoeffer) along with the true Cinderella of Lent Madness (Emma). If anyone who completed a bracket before the start of Lent Madness had Emma of Hawaii making it this far, we commend you for your prophetic voice. Though we secretly believe you’re lying. 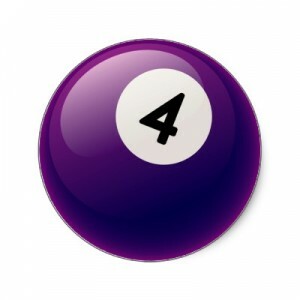 Seriously, did anyone out there pick Emma to make it to the Faithful Four? To get to this point, Dietrich Bonhoeffer defeated James the Apostle, Brigid of Kildare, and Jerome while Emma of Hawaii got past Catherine of Siena, Paul of Tarsus, and Thomas Cranmer. And now, in the final battle before the Championship Round, we turn it over to celebrity bloggers Neil Alan Willard (Dietrich Bonhoeffer) and Heidi Shott (Emma of Hawaii). Just as a reminder, the polls for the Golden Halo will open at 8:00 am on Spy Wednesday and close at 8:00 am on Maundy Thursday. Here’s the updated bracket. 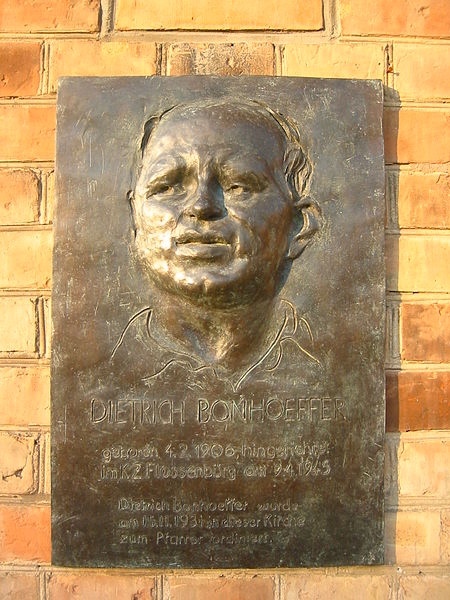 Easter Monday will mark the sixty-seventh anniversary of the execution of Dietrich Bonhoeffer at the Flossenbürg concentration camp in Nazi Germany and of his last words: “This is the end – for me the beginning of life.” Those words, it seems to me, testify to the Easter faith that will be proclaimed this weekend throughout the world. In proximity to human suffering on a scale that is unimaginable to most of us, Bonhoeffer was able to declare that the ultimate word, a word of life, belongs to God. The St. Stephen’s Martyrs – a group of men at my church – gather weekly for an hour or so of theology and a pint or so of beer. About a year ago we talked about the Holocaust. While having that discussion, there were related artifacts, Nazi and otherwise, in the middle of the table. It’s one thing to see th ose objects in old black and white news reels and quite another to see them in living color as we wrestled with suffering, revenge, justice, doubt, and – yes – faith, too. I can’t imagine how much harder it must have been for Bonhoeffer and others as they together wrestled not with relics but with realities. These were imperfect people, including Bonhoeffer, making imperfect decisions that they would have to live with for the rest of their lives. Would we have returned home to Germany rather than stay in the United States? Would we have supported an underground seminary for the Confessing Church? Would we have chosen to jam the wheel of injustice by helping the conspiracy to assassinate the Nazi Führer Adolf Hitler? Bonhoeffer made a decision, as a result of his faith in Christ, to stand with his own people and with the innocent in the midst of their experience of Good Friday. That, I think, was his most important and courageous decision. The Archbishop of Canterbury has cast his vote. Now it’s your turn. After such hefty and regular doses of saintliness these past 40 days, the notion of what constitutes a saint is somewhat clearer in my mind. Several characteristics stand out: faithfulness to God despite hardship, fierce loyalty to one’s people, extravagant charity outside the bounds of cultural and social expectations. 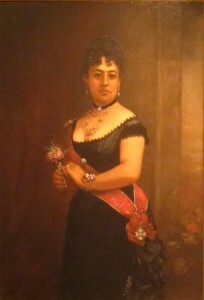 Queen Emma of Hawaii displayed all of these in boundless measure. Ultimately saintliness – our own included – is determined by the choices we human beings make over the course of our lives. Emma’s remarkable witness and legacy is defined by her choices. Despite the tragedy of losing her beloved young son and her cherished husband as a woman still in her twenties, she chose to overcome her grief and become a staunch advocate for the Anglican mission in Hawaii and for her people. Despite her high station in life, she chose to work tirelessly to improve the health, the education, and the spiritual well-being of native Hawaiians of all ranks as well as haolies and foreigners. I am deeply inspired by the choices that Queen Emma made. She could have hunkered down in a cocoon of grief and privilege given her losses, her wealth, and her royal status. She could have abandoned the work of building the cathedral and the schools, but instead she sailed across two oceans to drum up funding for the cause. Indeed Bishop Wilberforce of Oxford, her guide in England, said, “…her energetic efforts and activities taxed his physical endurance.” By the time she left England – where she drew standing-room only crowds at numerous cathedrals – she had raised 6,000 pounds (about $640,000 in today’s currency) for the work in Hawaii. Many saints are honored and venerated, but few are so beloved – generation beyond generation – as Queen Emma of Hawaii. “Love begets love” is right, and a standard for all the saints of God. 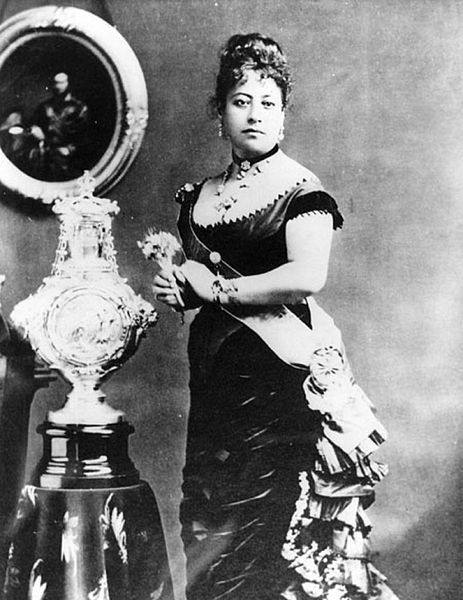 NOTE: At 12:14 a.m. EDT, the Supreme Executive Committee removed 70 votes from Emma of Hawaii. We noticed that there were 20 votes in close succession from a residence in Hawaii and 50 from a residence in Arizona. While we commend your enthusiasm, we do not commend repeat voting. We’re watching this one carefully, so don’t vote more than once, please. 106 Comments to "Dietrich Bonhoeffer vs. Emma of Hawaii"
Bonhoeffer. No question about it. Queen Emma’s moon is in my skies. Inspite of potentially devastated losses she continued to be faitherful to God and her people. Through charity and kidness, she built hospitals, churches, schools and libraries, and we continue to benefit from her life’s work today. Kaleleonalani. Absolutely! Sorry to disappoint everyone but no video today. The loss of sons seems to be the theme of this week–the most important being Mary’s boy. I was truly going to vote for Dietrich Bonhoeffer, but reconsidered after the funeral yesterday of one of my high school students (only 16). I sat and ached for his mother and father, and decided to vote for Emma, not because she’s the Cinderella of Lenten Madness, but because as a mother, she did so much after losing so much. Dietrich gave everything he had. I went with Emma today. I admire her decision to help others in response to her grief. I will never be comfortable with Dietrich’s decision to be involved in a plot to kill Hitler. I won’t speak for Cori, but for me it is simple. God told us “thou shalt not kill.” He also said, “Vengance is mine, I shall repay.” If God wanted Hitler dead, He could have sent a bolt of lightning or arranged for him to fall down a flight of stairs. That He did not may seem hard for us, but doubtless He had His reasons. It isn’t for us to second-guess Him. My main problem with this is that it’s difficult to clearly delineate how this might not also “justify” killing doctors that provide abortions. That said, I’m still a huge fan of Bonhoeffer, and he got my vote. But this was another tough one. Thanks for making this happen, Lent Madness Crew! That is indeed a problem (my thoughts went to the same place). But DB is also correct about the problem of keeping your hands clean and thinking that makes you innocent. Pilate was a great one for that, as I recall — to be seasonal about it! Ethical decision-making in a lived faith can be…well…murder. Or not. Makes you think. Thanks for posting the quotation. Killing is wrong. So why does it seem so ‘necessary’ to us sometimes? Why do so many people say what happens is “what God wants” — God gave us free will, what we do with that may or may not be what God wants. Thank you, Sister Mary, for writing that summary. God’s gift to us of free will is huge. There’s not enough space here to explore the meaning of Free Will. Your statement is helpful and revs up my brain! I know what is it to lose a child. It is a grief which remains for all this lifetime but hopefully, like Emma, the suffering becomes a life-giving gift to others in need. I deeply respect and understand Emma’s faith witness and she would have my vote if not for the martyr Bonhoeffer. Bonhoeffer: a man for all seasons and for all reasons. Wow! out of what, 35 voting sessions I have only missed 7 saints. Pretty good discernment on my part. I’ll see if my Golden Halo prediction carries through as a win as well. Now why didn’t I buy that lottery ticket?!?!?!?! I choose Bonhoeffer without hesitation. He was a soldier in a war against madness. He left safety behind and marched straight into hell where he ministered to the souls around him, including his captors. He didn’t turn from his cup. His life and writings reach across the generations to inspire and uplift. Nice write up, Neil Alan Willard. Bonhoeffer for me. Great write-ups today. Both saints look a bit less “saintly” and a lot more real and personal and thus easier to relate to. I think that I have to go with Emma today. My bad. It’s been a long time since I was a haole teacher on Saipan. DB. He could have remained in this country and safely ridden out the war. In the face of grave personal danger, he chose to return to his country and to actively resist perhaps the most evil movement of the 20th century. I understand, and, to an extent identify with Cori’s comment, but I also must consider the context in which Bonhoeffer, at such obvious personal risk, participated in the effort to stop what many would call the most evil force of the 20th Century. RIP Dietrich. I voted for Bonhoeffer; however, will not be disappointed if Emma wins. From what I’ve learned about her, it seems her path sainthood is similar to the more ancient path to sainthood, where someone became a saint because people in the local community saw them as such and continued to be devoted to them after their deaths. In her case she built in her own Cathedral rather than a chapel being built for her. For me, it was a clear choice. Not that Emma is less than wonderful and did great things for her people, but Bonhoeffer gave absolutely everything for his faith, including his life. Emma joined with Victoria, one of the worlds greatest colonialisers, while Bonhoeffer stood up against Hitler, one of histories great Satans. Heidi and Neil have done an excellent job of giving us a peak into all the saints about which they have written and today is the “frosting on the cake” or should I say “the polish on the halo”. Scott and Tim did an excellent job of choosing (and coaching?) the guest authors. All the write ups have been wonderful. Before I read todays comments I was sure I would vote for DB, a true martyr but Emma captured me. Perhaps that is why she is a “Cinderella”? Still not sure who will get my vote. Good contest. It’s hard to choose when I voted for both, but Bonhoeffer gets my vote again this time. “This is the end-for me, the beginning of life.” On Maundy Thursday, on Good Friday, at the Great Vigil as the new fire blazes forth from a spark to glorious light and the bells peal throughout the cathedral, on Easter morn, and finally on Easter Moday, these words wil echo and re-echo throughout my head. They are now indelibly imprinted on my poor feeble brain and in my heart. I’ve had a glorious time with LENT MADNESS, but for the first time, it really doesn’t matter who wins the GOLDEN HALO, because he who chose to lose his life by returning to fight pure unadulterated evil knew the only result would be sure and certain death, but the ultimate victory. I love the story of Emma, but I must go with Bonhoeffer, who not only gave his life to save the faith in a beleaguered country, but inspired countless others to live their lives more in harmony with God than would have been the case under the terrors of Nazism. We think both saints were amazing people. Since we couldn’t decide we got our Wilson tennis racket out and voted down or up. The W was for Emma and the M was for Bonhoeffer. The racket came up with the W. So we are voting for Emma of Hawaii! Neil Alan Willard’s write up made me weep. Bonhoeffer for me, today. Easter Monday is the date of DB’s martyrdom. ‘Nuff said. Kitschy and daft and fun. I laughed and learned as the brackets churned. I’m sorry it’s almost done. And one fought the Nazis and one did not. But Deitrich’s the one for me. Rachel and Adam announced their intentions to vote for Bonhoeffer at breakfast, so I’m betting that’s what we’ll do unless someone has a last-minute change of heart. Bonhoeffer truly is a saint. No contest. But Emma represents for me someone wonderful among the Hawaiian people. She was caught up as an Anglophile in her moment in time. But she never lost sight of her responsibility to her people and being a servant in addressing their needs. I love her for that and am grateful for what a model she is for the Church in Hawaii today, a true servant leader. DB for me. What an inspiration! I shall think of him on Easter Monday. Wake up, Hawaiians, and vote for your Queen Emma. So, did you vote against Margaret when so many Scots/Celts were pulling for her? I don’t remember anybody rallying all Celts or all Margarets! Guess I just remembered the discussion about whether she was instead English, Hungarian, anti-Celtic church and figured it would balance! So, what WAS Bonhoeffer’s role in the plot ? 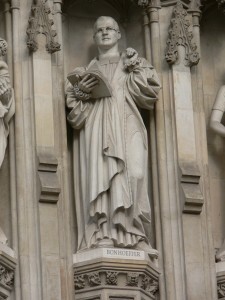 He communicated with George Bell, Bishop of Chichester. He could travel outside of Germany with his papers. He told Bell what was going on in Germany: jews, concentration camps, the works. Bell, in turn, talked to government leaders (Eden, etc) to keep them current with German Resistance. The British government was ambivalent at best, never agreeing to support those trying to depose Hitler and the nazis. Bell and Bonhoeffer went way back, they were co-conspirators against death and hatred.. in short, the war. Bell, carefully laundering the information from Bonhoeffer, wrote letters in The Times, spoke in the pulpit, and addressed the House of Lords; getting the word out. He was opposed by C of C leadership and Churchill. He spoke out, too, against the RAF policy of saturation bombing, dropping bombs at night over Hamburg and other cities to simply destroy whatever they could. Although it was demonstrated during the war, and proven after the war, that this bombing attack – exactly the same as the blitz against London and Coventry served no military purpose, it was supported wholeheartedly by Temple and others who proclaimed that it was better for German civilians to die in the night than for British civilians to die in the night. The firebombing of Dresden and Tokyo were evils of the same nature as anything the Nazis did, and Bell stood against it. Bonhoeffer and Bell fought both Hitler and Churchill, (and Roosevelt), and the established church. Their plot was not only against Hitler, but against Shock and Awe, inhumanity, hatred and evil from both sides of the war. THEIR battle, Bonhoeffer’s war, is still being fought today. We still manage to parse our “Christian religion” in Nationalist and ideological terms, while women, homosexuals, the poor…. on and on and on… are under attack from all sides. We are still fighting Bonhoeffer’s war, which simply involves the job of following Jesus, of being for other people. Dismissing Bonhoeffer simply as a ‘Hitler Plotter’ is to put the commandment into a box, and putting it out of sight: In Holy Week, love each other as I have loved you. No exceptions, not loopholes. Dietrich recognized HIS choice was to sacrifice his cherished pacifism, and deny his God, or to accept his God, and deny his comfortable principle. He said he would give up himself and follow Christ. don, beautifully said. Both profiles are excellent; I have lots to ponder about both of these saints. What I have really loved about LM is adding what i have learned about the saints to my prayer and meditative life. I’m also sharing with my three daughters. Love it! and I choose Bonhoeffer. the decisions made by Bonhoeffer and Bell humble me. I am pleased to know more about this Halo-worthy man. 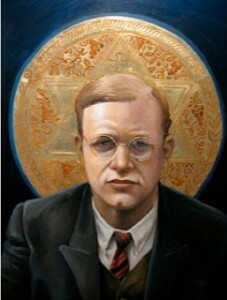 Bonhoeffer will be in my prayers this Holy Week. Thank you Peg, for doing what I wanted to do – make a Lent Madness verse to one of my favorite hymns! I love it. And Thank you Don for the added information about Bonhoeffer. He gets my vote today. Thank you Don Cardwell for that excellent insight. Although I chose Bonhoeffer, both he and Emma demonstrate courage and grace to be emulated. My daily problems seem so petty compared to theirs. on as before. Also, if this assassination plot was God’s Will , why did it fail? Ē nā ali‘i, ma ka hana maika‘i i lawe mai ai ka ho‘omana, ka na‘auao me ka ho‘ōla; a ma ka ‘eha ā pilikia ne he ‘ohana i loko o Kristo e a‘o mai i ka ha‘aha‘a me ke aloha e ho‘omaika‘i ko‘olua mau inoa, ā e nonoi a‘e e pule ai no mākou, ‘o kō ‘olua mau keiki mana lani. When I was young in the 40’s & 50’s I read the literature of WWII. The heroes (male and female) of the various resistance movements were my heroes. It was not until I was in college that I read of Bonhoeffer. But he joined that pantheon. But now I am much older. I have spent many years studying local history in the various places where I have lived, including this place. Each of our native saints have had to decide how to proceed in order that their people might not perish and might preserve what they can of their life and land. Native people everywhere have chosen different strategies. They have given their lives that others might live. All of us who are of European descent living in the other places of the world must humbly ask “on whose land am I standing” and “at what price was it secured for me.” In this day and age, it is a complicated thing for me to honor Bonhoeffer while others who plot to kill to protect their people are branded savages, terrorists, etc. The price Emma paid was perhaps not as visible as the price paid by Bonhoeffer, but it was no less heroic. To men perhaps it looks as if she benefited from her choices. But many of us who have related across cultural boundaries in times such as hers and ours, know that we die many small deaths in the service of love. I love the line “She loved the people. Love begets love…” My vote goes for Emma who like Esther was faithful via a woman’s way of being. If you go far enough back, EVERYONE is living on land that his ancestors took from someone else’s ancestors, unless you live in the Olvadui Gorge. I am currently reading, “Bonhoeffer: Pastor, Martyr, Prophet, Spy,” by Eric Metaxas. I make a confession here, now, that I did not know about this amazing man (SAINT) until this year when I joined a group at church — Journey to Jesus. Bonhoeffer came up in a conversation about theology and important theologians. One of the deacons in our group raved about Dietrich Bonhoeffer, so I began searching for information about him. All I can say is, WOW!!! I, too, would love to spend time with this saint — dinner, walk in the park, listening to his sermons … ! I’m not sure Bonhoeffer did consider his decision ‘morally defensible’. My impression is that he struggled greatly with what a faithful response to the atrocities he was witnessing should be. What don said, about sacrificing principles (and what Kierkegaard says, about Abraham and Isaac). I greatly admire Queen Emma for her legacy of faith and service despite significant personal hardship. I’m voting Bonhoeffer because of his legacy of faith, service, and struggle. I find his writings (eg ‘religionless Christianity’ and the cost of discipleship) and the example of his life deeply inspirational. Because I look around and see a world where the path of God’s Will isn’t always lit up with runway lights, I appreciate the lamp Bonhoeffer holds to guide my feet. Dietrich Bonhoeffer was not involved in any plot to kill Hitler. The activities of various German resistance movoments are well documented and an excellent source of information are the various Jewish Archives regarding World War II. These archives agree that although DB was involved in a plot against Hitler it was not a plot to kill him. In 1938 members of the German Officer Corps became concerned that Hitler was going to lead Germany into a senseless war that Germany would lose. When they became aware of Hitler’s plans to invade Czechoslavakia they recruited Bonhoeffer in hopes of blocking Hitler’s plans. Bonhoeffer was sent to England to use his friend George Bell to convey to the British that opposition to Hitler’s plans existed within the military. The plotters hoped that Bonhoeffer and Bell could convince England and France to take a firm position against Hitler’s plan and that between all of them Hitler would be forced to back down. The plot failed because the British were not convinced that the opposition in Germany was well enough organized to be effective and British Prime Minister Neville Chamberlain thought that he could negotiate with Hitler. Some have agonized that Bonhoeffer violated his principles by plotting to kill Hitler. I think that history actually tells us that Dietrich Bonhoeffer stood firmly on his principles by plotting to keep peace and preventing war. I haven’t spent time with primary sources but at least one published biography describes his statement at his brother-in-law’s that he would be willing to kill Hitler or assist in a plan to do so, but that he would resign from the Confessing Church first (made in the context of repeated rebuffs of by Churchill et al later in the war). I think his choices were considered and costly — I like dr. primrose’s post on ethical decision-making. I would agree with you on Dr. Primrose’s post on ethical decision making. In addition it is true that Bonhoeffer’s decisions were considered and costly. First he was involved in a plot to involve England in blocking Hitler’s plans to invade another nation. Later he was involved in a plot to smuggle German Jews to Switzerland using forged diplomatic visas bought with money diverted from the German Intelligence Service. These acts forced him to decide if a private citizen should plot to thwart the plans of the duly elected, although hellish, leader of the country. Regarding personal safety either of these plots, if discovered, would have been more than enough to send him to the gallows. Bonhoeffer. As I said earlier on in this contest. Bonhoeffer showed that ethical decision-making is often very, very hard. The problem is not following the rules in a particular situation. The problem is that in a particular situation there are rules that conflict. If I follow one, some good and some evil will happen. If I follow the other, the same thing. No matter what I do, something good will happen but something evil will also happen. Or I can sit in paralysis and do nothing at all. Which may result in more evil than choosing one way or the other. In his Ethics, I think he realizes that in this type of situation, he has to accept guilt for the evil that results from whatever decision he makes and to ask God for forgiveness. He was not asking for a free pass or a get out of jail card. This is a difficult vote. In the end I remembered a quote I read that said “All that is necessary for evil to prosper is that a few good men do nothing” My heart goes to Emma for the tender care she took of her people, but Deitrich’s example of standing against evil was so powerful. A wonderful example of giving all for Christ and his people. Hawaiians, come to the aid of your dear Queen Emma. She gave so much to her church and people, you see and feel her love everyday, in all you do. Love begets love. That says it all! h+++. Priory peeps, vote! As a young mother active in Cursillo, Sunday School and other church activities, I would notice that when the Battle Hymn of the Republic was sung in groups, people around me would change the “let us die to make men free.” line to “let us live to make men free.” The Battle Hymn of the Republic is a great rousing war song and dying for ones Jesus is always stiring to those of us who probably won’t ever have to. Both DB and Emma were great people and the decision has taken me all day. But, at 67, I have to believe that, if I’ve been lucky and blessed, I’ve lived to make men and women free. That doesn’t make me saintly by any means but it does make me want to walk more closely with Jesus and Emma. Oh, how I have dreaded this day. Having to choose between Deitrich Bonhoeffer and Queen Emma is the toughest call I have had to make during this LM season! I have thought long and hard about this throughout the day. Both are admirable in their faithfulness to and love of Jesus. And both have certainly earned the saintly right to move on into the championship match for the Golden Halo. In the end, however, I went with DB. That doesn’t mean I love Emma any less. God bless them both for their lives of service to our Lord and Church. Today is my daughter’s 40th Birthday and when I think of how young she is, I am reminded that Dietrich Bonhoeffer never reached his 40th Birthday! To be so wise, so compassionate, so willing to die for his faith–at such a young age–sorry, Emma, my heart belongs to Dietrich! P S: terrific write-up today. Lois, don’t give up the ghost on Emma. Our Hawaiian brothers and sisters are six hours behind eastern time. They have six extra hours to vote! Emma deserves the Golden Halo and the halo will look so beautiful upon her golden skin and hair. Love begets love! Mahalo, Emma of the people. This fits with my understanding, too. Thanks for posting. Now it is so difficult that I had to choose the prettiest with the best looking outfits. I was first introduced to Bonhoeffer in a	Christian Ethics class in 1965. Such a revelation. Vote Bonhoeffer. Tim, I must brag on Penny Nash’s behalf – here at Bruton Parish in Williamsburg, VA, six in our youth group had Emma making it this far! Serendipitously, I just returned from the Chrism Mass in the Diocese of California where we sang hymn 695. “And when this cup you give is filled to brimming with bitter suffering, hard to understand, we take it thankfully and without trembling, out of so good and so beloved a hand.” These words were taken from a prayer “By Gracious Powers” written by Dietrich Bonhoeffer shortly before his death. On my way to the service, I passed a sign commemorating Dr. Martin Luther King Jr. I hadn’t realized he was only 39 when he died. Back when I was nineteen, thirty-nine seemed a whole lot older. Now it seems impossibly young for so much wisdom in the face of the evil we humans hurl at each other. I have voted for Bonhoeffer throughout Lent Madness until today. I fully intended to vote for him today. After reading the inspired write ups for these two worthy people, I felt the urge to vote for Emma. 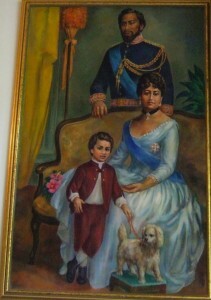 They lived in different circumstances in which both were responsible for laudable acts of courage, conscience, and love. They are both inspirational to me for different reasons. And from all the other comments, they are to many of you too. So I guess the Emma push is on! Well, I think it’s kind of nice that a bishop gets involved in Lent Madness . . . I wonder how many other bishops would even give it a thought? Scroll up and read Laurie Awater’s haiku. And vote Bonhoeffer. It is 11:21 pm eastern time & I just got home from Baylor wiping out Notre Dame in the women’s final four. I’m surprised to see that Emma has not done her come from behind thing yet. I did have a few extra minutes before meeting friends and went into a smaller Christian book store– the only two saints represented in the biography section were Bonhoeffer and Paul, which I thought was interesting. I was disappointed there was no saints section, but then again I’ve yet to be in one of these stores that has a Book of Common Prayer. My vote today is for Dietrich Bonhoeffer. Much has been made of his part in the war, but my thoughts go the positive things he brought to my faith and ideas of Christ in this world. The idea that “…the idea of God embodied in Jesus, available to anyone at any time.” “This body of Jesus Christ is not bound by space, but is present in all places at the same time…” His written thoughts brought new life to bible passages and in my times of need. He is still helping our world today! Voting ends at about 8:00 a.m. Eastern time, Wednesday morning. As LM progresses to its conclusion, I think we’ve all felt more involved with the each of the remaining saints. We’ve read, prayed, struggled to find “the best” saint. Though we know each one of them was the best saint for his or her time & place, it is a terrible burden to choose just one and exclude the other. It’s been an interesting Lenten study. Thank you Fr. Tim & Fr. Scott & Celebrity Bloggers for all your organization and writing and some serious humor! I vote for Bonhoeffer today. This has been an incredibe learning experience, and I thoroughly enjoy all the info & banter by Lent Madness writers. Being from Hawai’i, I know how important Queen Emma is to Hawai’i, and her legacy continues in everything that she established– to save lives (the Hawaiian population was on the verge of extinction with a population that went from 350K to 70K from diseases brought by foreigners – that is why she raised money for a hospital, now Queen’s Medical Center – I was born there! ), educate (schools) and of course, bringing the Anglican Church to Hawai’i. She literally went on foot from door to door (yes, Queen that she was she still hit the pavement) to raise funds and awareness for these things…all with grace and passion despite tragedy. We have a volunteer bookstore at our church, and we carry books on Bonhoeffer AND Queen Emma for they are both courageous and remarkable people. No matter who captures the most votes, we all win… and a lot more people know about our beloved Queen. Thank you Lent Madness! Amen! Indeed, SN. This has been a wonderful learning experience! I’m truly impressed that Emma’s supporters pushed her over the top against my pick. After all I’ve learned about her, Emma will certainly have my vote in the final round against Mary Magdalene. It is very sad to learn of the manipulation of the voting process by proponents of Queen Emma. It places the result in doubt and is a dishonor to Queen Emma, and in Holy Week no less. A lesson to all of us about our need for a Saviour. Nevertheless, Lent Madness is a wonderful gift. There was actually equal opportunity voter fraud in this round (by just a few folks). We deleted the multiple votes and are confident that the results are clean. Sad but ultimately not affecting the outcome. So sad. But then I guess I take these things too seriously. Just can’t see how Emma can top Deitrich in any category except in a popularity contest. I have tried to vote for those who I thought was more spiritually deserving of a halo. But I hope the rest of you are enjoying the game! I hear what you’re saying, but Emma’s work saved lives too. That’s important. The witness of her life and the love and loyalty she inspired in her people is quite something. It does depend on what criteria you use to decide your vote. I agree that DB’s life witness and theological legacy is amazing (I voted for him wholeheartedly throughout). But theological prowess mustn’t ever be the sole criterion for a halo, IMHO. I’ve known theologians — astonishingly gifted preachers — who couldn’t love their way out of a paper bag. What would Jesus have to say about that? I love that there’s a wide freedom to choose here. What beautiful and moving tributes to both Bonhoeffer and Emma. Thank you both! Rereading them will ease my sadness over the end of Lent Madness. Supreme executive committee? Haha sounds like some wardens on steroids! 2 Trackbacks to "Dietrich Bonhoeffer vs. Emma of Hawaii"